I’ve entered a new chapter in my time here. The biggest (and most welcome) change has been that my partner Marc finally arrived! With him marveling at the awesomeness of this place, I’ve been in a renewed state of gratitude for the incredibly privileged situation we’re in. As was clear during the work camp’s final walkabout tour, so much intention and effort goes into continual improvement and overall beautification of the retreat centre. There’s truly a huge community of dedicated people who call this place home and put their hearts and souls into making it even better every year. 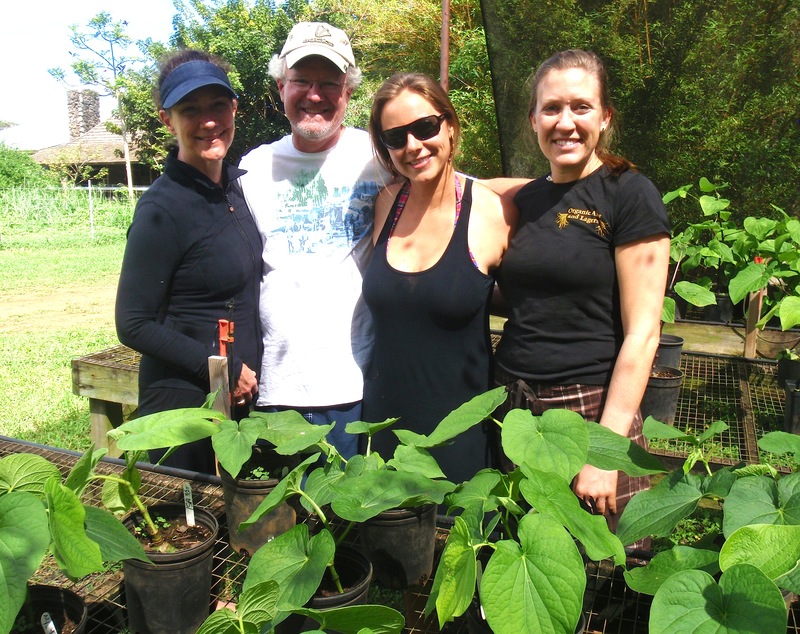 The garden is a peaceful zen space thanks to all the efforts of my garden team who transplanted hundreds of plants, expanded the growing space significantly, and left me feeling like I could take some time away to welcome Marc into the scene and catch up after a month apart. The ability to relax in the sun by the pool on hot afternoons; to eat gourmet meals and sweet treats every day; and to play games every night with our friends seems at once surreal and yet so normal. In fact, what it underscores most to me is how blessed we are in our lives on a larger scale than this experience. As one work camp guest put it last week, just to have hot running water out of a tap makes us some of the most privileged people in the world. 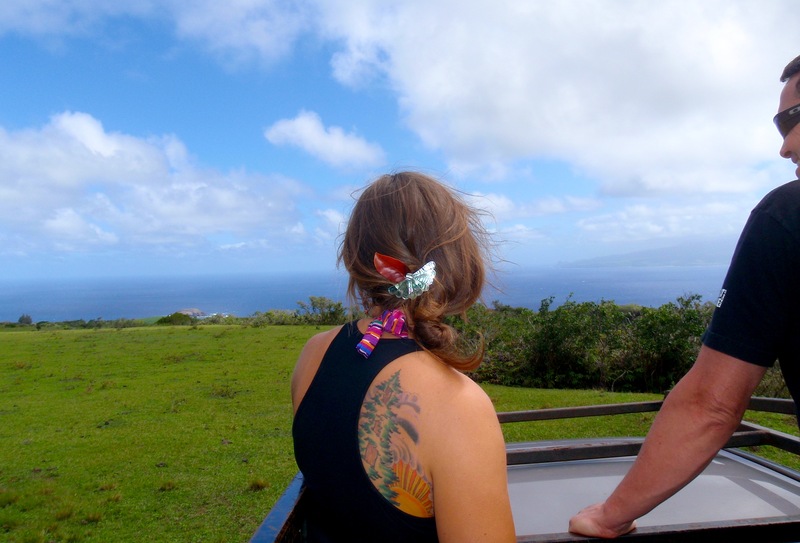 We hopped in the back of the truck and wound our way up the bumpy road till there were steep dropoffs covered in lush vegetation surrounding us on both sides. Looking back down with ocean and mountains all around us, we could see Maui rising up straight ahead. On our return, we stopped to visit the cutest baby goats of all time. Two curious boys–one small and sand-coloured and one white–and a little girl with chocolate spots craned their heads out of the fence to be scratched behind the ears. It was at that moment that my heart melted into a gooey soup of love. Recovering enough to get back in the car, we wound our way further along the one-lane highway till we took a 90 degree turn around a cliff and found ourselves towering above one of the most spectacular scenes I’ve ever witnessed. 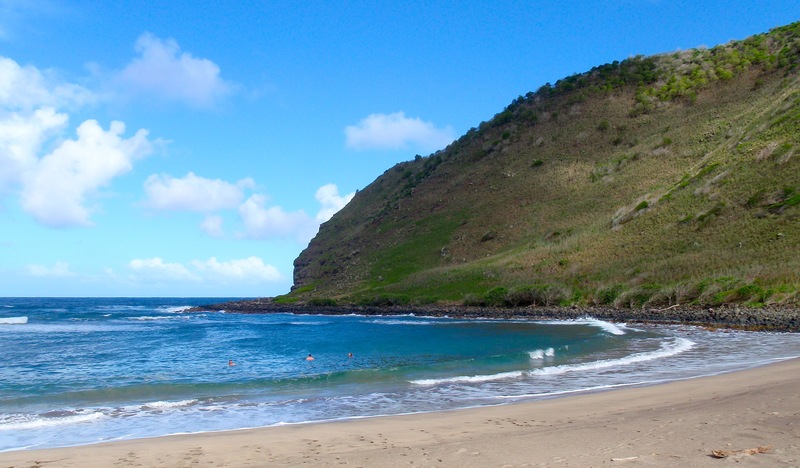 Halawa (pronounced Halava) Bay is a remote river valley ending in two curved sandy beaches and surrounded on all sides by looming mountainsides. In the distant middle of the bowl, we could see a long, white line of water coming down. 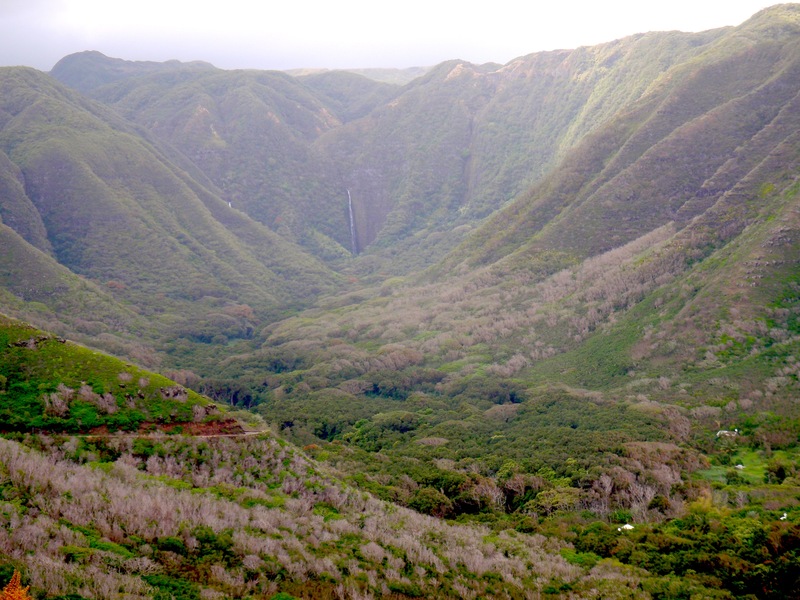 The Moaula Falls and Hipuapua Falls are one of the greatest sights on Molokai. 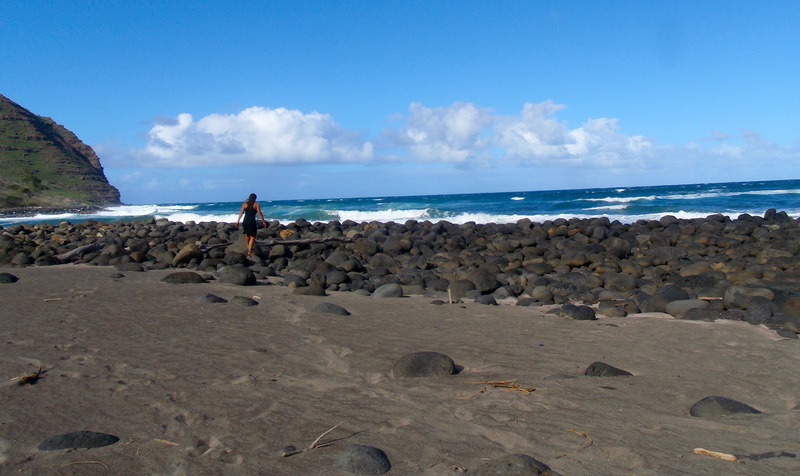 On this breathtaking and deserted beach, I jumped into the waves with my new friends. 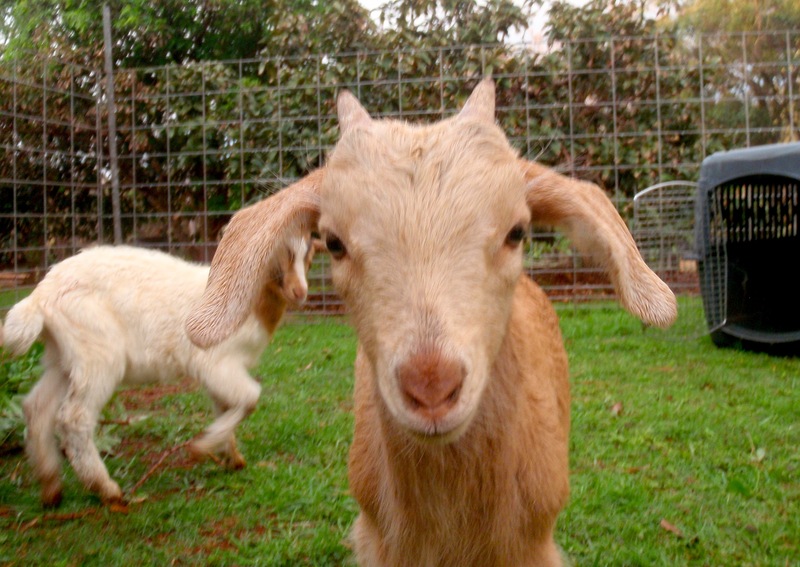 Arriving back at home, a startling surprise was waiting for us.. We got goats!!! Yes, the sandy coloured boy and the little girl are now living in a pen just beyond the door to our apartment. It was bittersweet, because that same day, they lost their mom, who had to be put down because she was sick. Motherless and in a scary new place, the kids have been wailing like crazy. They can scream and yell just like human babies. All they want is to be cuddled and fed long stalks of collard greens, and everyone just wants to do just that. The third kid joined us for a few days but has since left–a few of us want to keep them, but new homes will need to be found for all the kids. 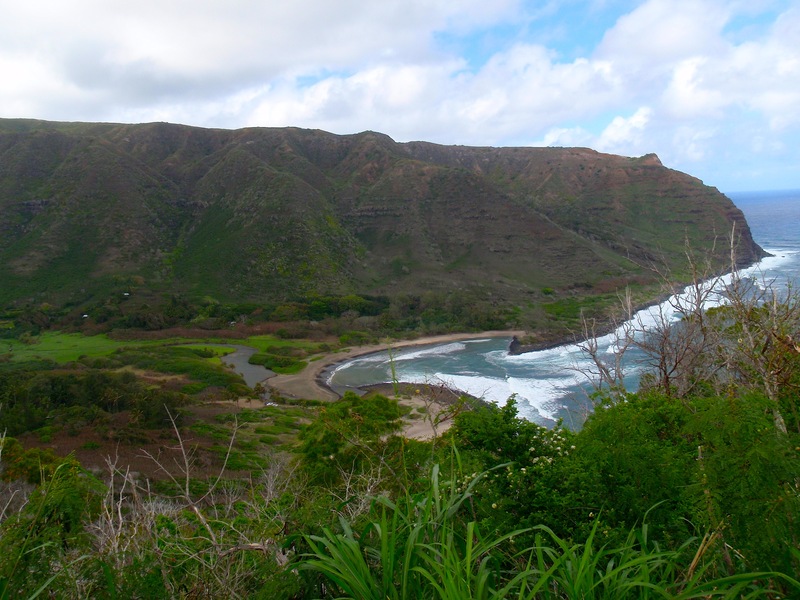 As Butch–the longtime mastermind and driver of the native plant restoration project–pointed out, the reason he’s doing what he does is because goats destroyed much of the native vegetation on the island. To have goats living right next to the native plant nursery is… well… throwing a bit of a wrench into the whole idyllic community thing. 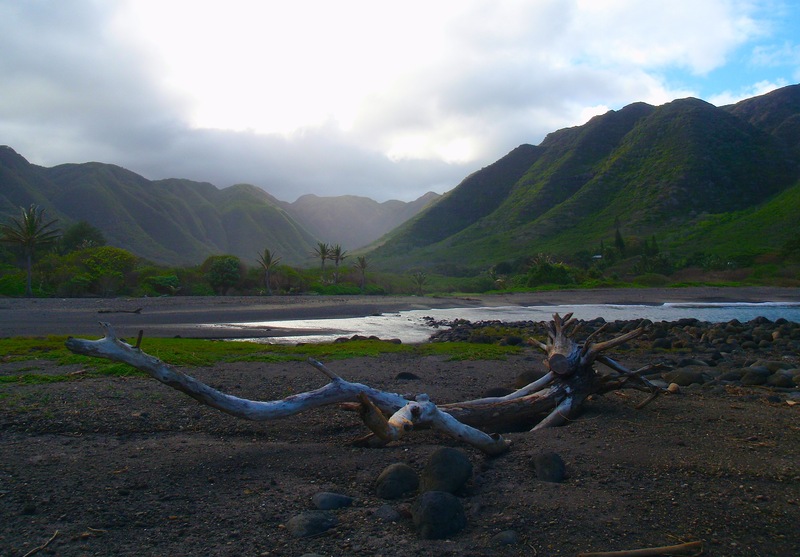 At least I get to keep the manure…..
Halawa Valley from the beach, late in the afternoon.